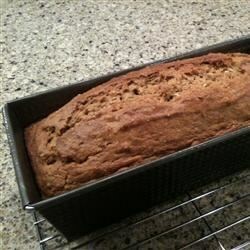 "A fragrant southern style quick bread. Perfect for the holidays." Preheat oven to 325 degrees F ( 165 degrees C ). Grease an 8x4 inch loaf pan. In a medium bowl, stir together the flour, baking powder, salt, nutmeg cinnamon, and sugar. Add the eggs, oil, and milk; mix until well blended. Finally, stir in the mashed sweet potatoes, pecans, and golden raisins. Pour the batter into the prepared pan. Bake for 70 minutes, or until a toothpick inserted comes out clean. Allow bread to cool in the pan at least 15 minutes before removing. For best flavor, store overnight before serving. Delicious sweet potatoes cooked in a cinnamon-sugar sauce.